Winter plays absolute havoc with our hair. Hours of intense GHD action can result in a frizzy curly barnet after just a few seconds in the rain. 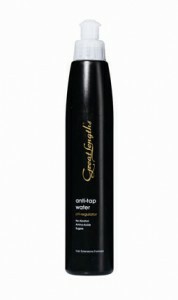 Great Lengths Anti Tap Water pH Regulator £12 is actually designed as an after-care product for hair extensions but it works extremely well as a kind of de-scaler on regular hair. The regulator contains keratin amino acids which help to eliminate the damaging effects of alkalinity. As well as reducing the frizz factor in humid conditions it also reduces colour fading, tangling and matting. Think of it as a detox for your hair, getting rid of all those inner city hard water nasties!